oh this is really cute! Love your little lady bugs! Great use of the buttons on the spine too! I'm really glad you played in Squigglefly's challenge this week! I hope you'll play again soon! This is dead cute Scrappy ! I love the little ladybugs you have added at the bottom of the notebook ! Cuuuuuute ! oh I love those buttons, how adorable! Aww, this is really adorable! There's something so cute about ladybugs isn't there? Thanks for playing the Crafty Creations challenge! Cute ladybirds, really sweet. Thanks for joining us at TG this week. This is great, Scrappy. Fabulous bugs. Thanks for taking part at The Crafty Pad this week. Absolutely adorable! Thanks for playing along with Clear It Out. Too cute. Love ladybugs. Thanks for sharing with us at GingerLoft Challenges! 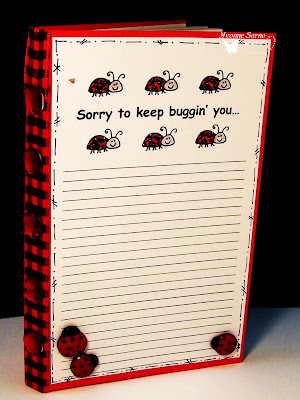 Very cute, love those lady bugs!!! Thanks for joining us over at Lexi's Creations this fortnight in our 'Ribbon (No Knots or Bows)' challenge - good luck.